The ceratosaurs (Ceratosauria, or “horned reptiles”) comprise a major theropod division. These were among the earliest theropods, arising during the Triassic period and evolving into much larger animals during the Jurassic period. Another ceratosaur characteristic included its upper jaw bone structure: there was a loose attachment between the two upper jaw bones, known as the premaxilla (a front bone of the upper jaw) and the maxilla (main upper jaw bone, behind the premaxilla). The notch formed by this arrangement was filled by a large tooth in the lower jaw when the mouth was closed. 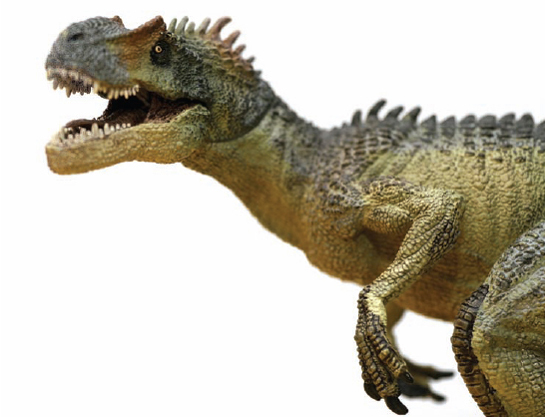 Allosaurs were a type of tetanuran, which included other carnivores such as velociraptors and the tyrannosaurs (iStock).